Follow the instructions below to install and configure your Poka theme! Upload the poka_v2.zip file which is inside your main zip via the the WordPress Admin Panel. 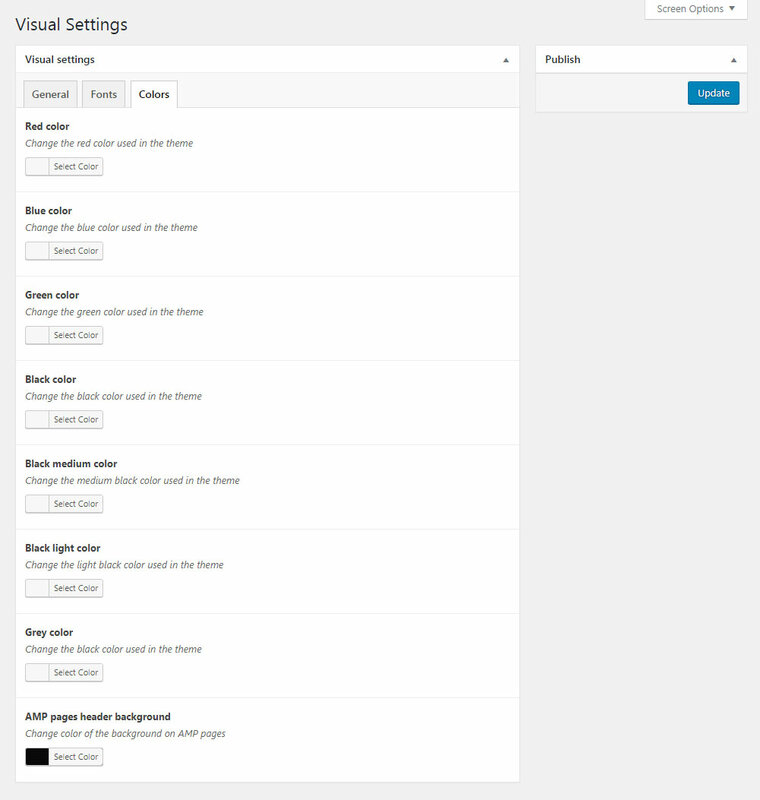 the WordPress Admin Panel (“Appearance” > “Themes”) and select “Activate” Poka v2 theme. 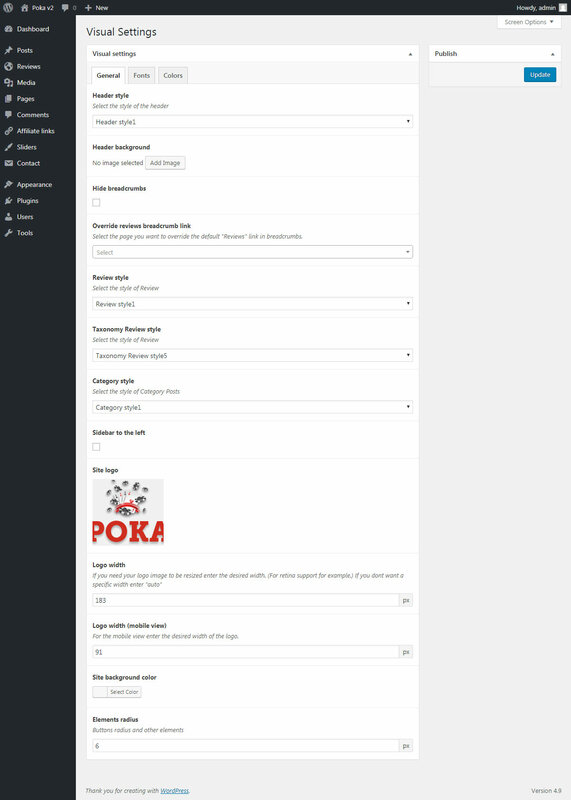 Poka v2 theme in future versions without losing your changes. functions in your child theme. For further help about Theme API contact us via email or support forum. Locate in your zip folder the sub folder of the demo you want. After install and activation go to Tools -> Import and select Options “Run Importer”. Go to Tools -> Import and install WordPress Import. Then select *-content.xml from your zip and click Upload file and import. After a couple of minutes (depending on your server/connection) when the import is completed. few steps for a successful migration. as possible but some data may need update in your site after Poka v2 activation. review logos in Poka v2. appropriate text. In Poka v1 a similar field was “Bonus small”. and paste the content from the old field. made to the old child theme to the new as needed. the review content you want. homepage of your site and you can customize it using all the available shortcodes. “Frontpage” at Settings/Reading “Front page displays” and select “A static page”. In this field you can enter the content you want to display next to the logo to the Header of the site. If you leave this field empty then nothing is going to appear. The link to your social account that is going to appear in the footer. If you leave it empty then the icon is going to hide. All the Reviews that contain an affiliate link use a specific URL structure to hide the affiliate link to the visitor. In this field you can set the URL structure for your affiliate links. The copyright text that is been displayed to the footer. If you want related posts widget in the bottom of your posts single page check this checkbox. You can have banners anywhere in the content with shortcodes or in the sidebar with Text widget or with the AdRotate ad widget. This is the banner available space after the main content and before the site footer widget area. image with a link or your Adrotate shortcode. With this field you can easily change the “Review” post type slug in the URL of your reviews. All Poka v2 sites display their reviews under the URL structure domain/review/review-title, now with this field you can add your own custom review slug. You can change the text in all the “Review” buttons in the site. You can change the text in all the “Play now” buttons in the site. You can change the text in all the “Play” buttons in the site. Poka v2 uses WordPress official translations management system using PO/MO files and if you want to completely translate your site to a different language this is the way to go. By using the options in Translations settings overrides PO/MO files, if you want to use PO/MO files just leave the buttons fields in translation settings empty. You can select how your header should look like by selecting one of the available header styles. You can override the default header background by uploading your own image. You can select one of the five different styles for the reviews taxonomies. You can select one of the two different styles for the posts categories. Check to display the sidebar to the left side of your site. Here you can upload the logo of your site. If your logo image is bigger than you actually want it in your site or if you want your logo to be retina ready in this field you can set the actual width for your logo. If no width is set then is going to be displayed as uploaded. For retina ready logo: If you want for example your logo to be 180px you can upload a logo at 360px and then set the width to 180px. set the width of your logo for the mobile view. The background color of your site. Select the border radius for buttons and other elements. The primary font color is going to be used to your site. You can change the font in your site with one of the availables in the dropdown. family” the main font family is going to be used. buttons and you can change it to whatever you like! You can use Posts in order to create news, video posts, tutorials etc and whatever else you need. 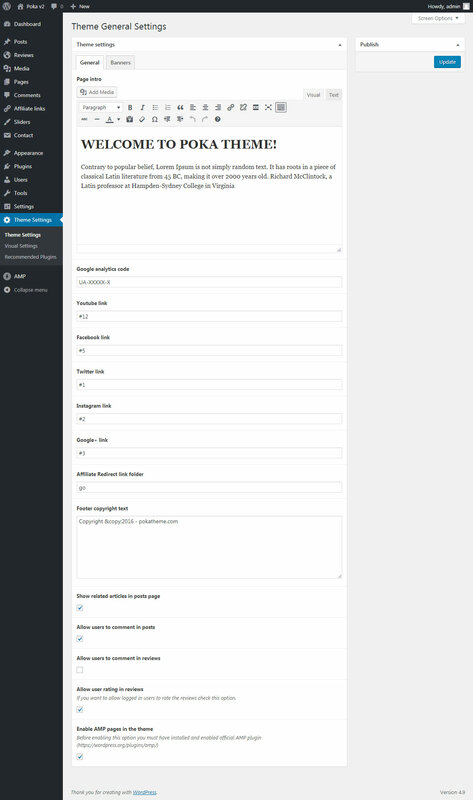 You can create categories and display the posts with the category view or with the news shortcode. In Posts there are available two post formats, standard and video. With video format the first video in your posts content is displayed as featured image in category view and in news shortcode. This is the post type that it is for your affiliates reviews. This post type has the metabox Affiliate fields where you can find all the available settings for each review. In this field you can find all the affiliate links you have created in Affiliate links post type. This is the affiliate link for your review when the user clicks Visit review. The bonus of the Review that is going to be used in widgets and in shortcodes . [single_affiliate_freespins] and in reviews pages. 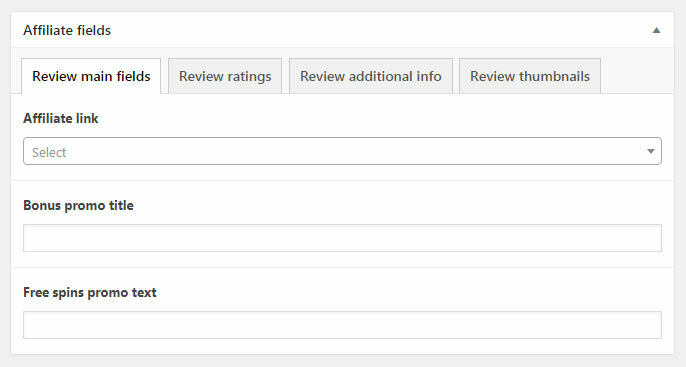 The rating of the review with available options 1-5 in order to display the stars in Review shortcodes, Review table and Review page. reviews not to start from zero. The text info that is going to be used in Review table. The list that displays the information about the review. It is displayed in the top of the Review page. You can enter as many list items as you want. The list items for the Pros and Cons of the review. In order to display the Pros/Cons box in the content you can use the [upsdowns] shortcode. This is the post type for all of your affiliate links. First you create the affiliate link and then you associate it with a Review with Affiliate link dropdown. The idea behind this structure is to have a separate Post type for the affiliate links in order to give you the option to use each affiliate link in multiple Reviews. The link you want the Play now button to lead to which is the target link you have from your affiliate associate. The word you want to be displayed in the frontend in the URL structure. This is the post type for the sliders of your site. Each post is a different slider and inside every slider you can set the slides and the options of the specific slider. You can add as many slides as you want with the Add image button. In every slide you can set the image of the slide, the alignment of the image, the Caption of the slide, the position of the Caption and if you want the Caption to have a black transparency for better readability in complex images. If you want the slider to auto rotate enter the time in ms. If you don’t want the slider to auto rotate enter 0. If you want for example each slide to stay for 8sec and then rotate to the next enter value 8000. 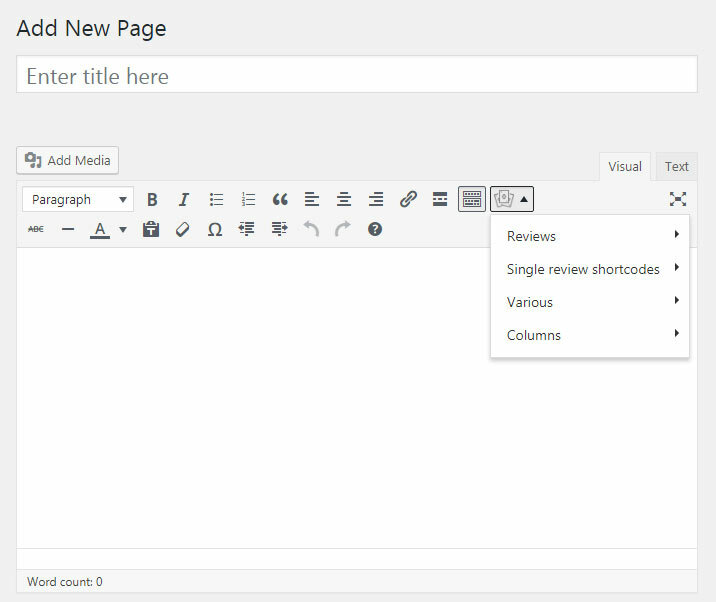 In every wordpress content editor (in any post type) you can find the shortcodes button where you can find all the custom shortcodes of the theme. The shortcode to use if you want to display a list with Reviews. cat : If you don’t want to display all the reviews but only the reviews that are in a category enter here the category slug. big_table : If you want to display the list in full width it’s better to set this option as true. reviews : If you want to display specific reviews you can list them by their ID in this parameter separated by comma. When this parameter is used overrides all the other parameters. The shortcode to use if you want to display a multi column list with Reviews. This shortcode to display the ajax search form for the reviews. This shortcode to display a single review post in two available sizes. title : The title of the Review post you want to display. size : The available options are small,big. The small size usually fits better in a widget area and inside a column and the big size fits better in whole content width. This shortcode is used to display a single review post with the Free spins bonus custom field. This shortcode is used to display a carousel with reviews in full width section. This shortcode to display a slideshow that you have already created in Slider post type. title : The title of the Slider you want to display. This shortcode can be used only inside Review post. It works in combination with the values you have entered in custom fields for Ups/Downs. First you enter your Ups/Downs in metabox and then you put the shortcode in content in the position you want to display the Ups/Downs box in the frontend. this shortcode you can create a carousel with the images in any place of the Review content. This shortcode to display the list of the Posts you have in a grid format. num : The number of the Posts you want to display. If you need to display all available Posts enter -1.
cat : If you don’t want to display all the Posts but only Posts from a specific category enter here the category ID. read_more_text : You can write your own text for the button for all the posts of the category. spaces like a text widget. This shortcode to display the 5 latest Posts in a boxy format. cat : If you don’t want to display all the Posts but only Posts from a specific category enter here the category slug. This shortcode to display a button based on your theme styles. href : The URL of your button. 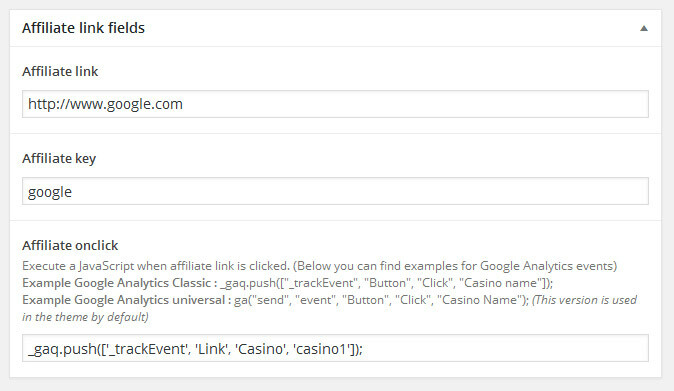 This shortcode is used to display a button with the affiliate link you want. icon : Copy and paste an icon from fontawesome. This shortcode is used to create a two colums layout. The content for each column must be placed inside each shortcode. 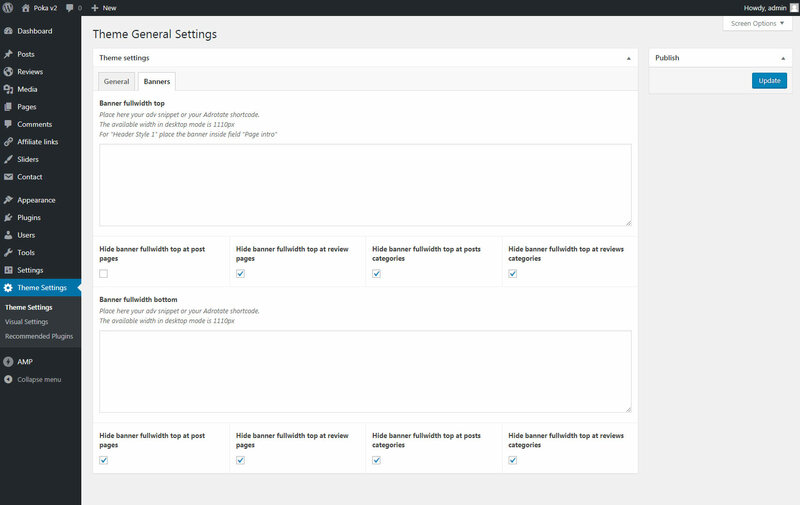 From the main WordPress Admin Panel select Appearance > Widgets and you can drag n’ drop any of the widgets to each of the available widgets areas. 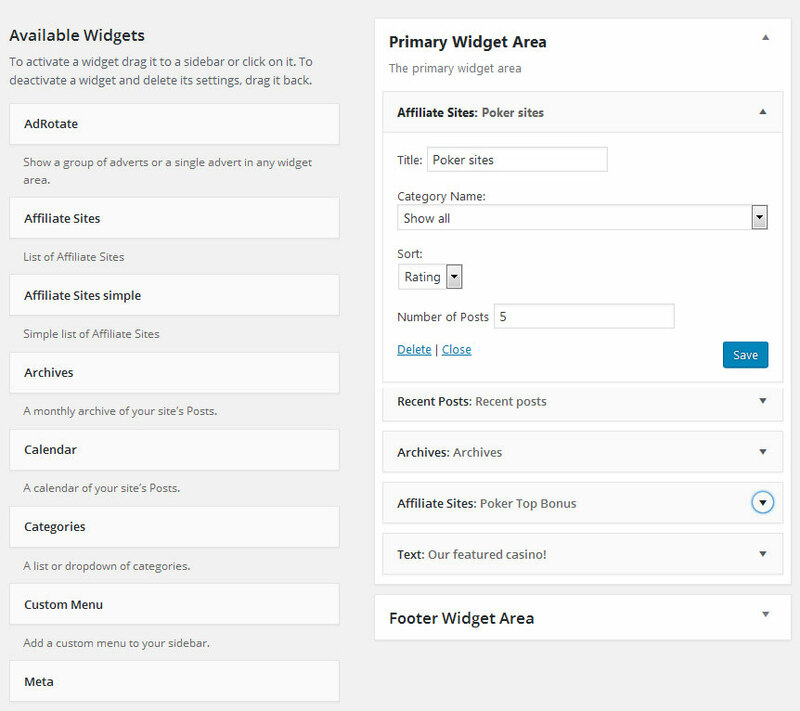 Primary Widget Area is the sidebar of the site and Footer Widget Area is the widget area that is above the footer. This widget can be used to display a list of reviews with ratings, bonus and two links one for affiliate link and to one review page. Title : The title of your widget. Category Name : If you want to display reviews from a specific category. Number of posts : How many reviews you want to display. Display only specific reviews (For example: 12,8,20) : If you want to display specific reviews you can list them in this parameter separated by comma. When this parameter is used overrides all the other parameters. This widget can be used to display a list of reviews with title and link to affiliate url.